If you don't see the document your looking for or have a question, please contact us! Rule 506 is by far the most widely used Regulation D exemption for conducting private placements. According to the SEC, about 90-95% of all private placements are conducted pursuant to Rule 506. This Rule permits sales of an unlimited dollar amount of securities without Securities Act registration, provided certain requirements are satisfied. Traditionally, issuers relied on Rule 506(b) that allows unlimited amounts to be raised from accredited investors and up to 35 non-accredited investors, so long as there was no general solicitation and advertising and other conditions were met. 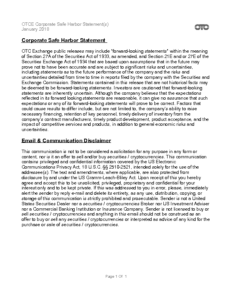 In implementing Section 201(a) of the JOBS Act, the SEC added a new Rule 506(c) that allows general solicitation and advertising in Rule 506 offerings so long as all purchasers of the securities are accredited investors and the issuer takes reasonable steps to verity their accredited investor status. 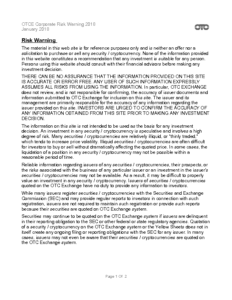 As of September 23, 2014, the SEC added a new section (d) to Rule 506. 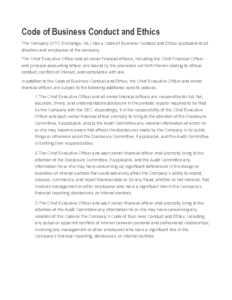 Rule 506(d) applies to all Rule 506 offerings, i.e., Rule 506(b) and Rule 506(c) offerings. It is important that all companies raising capital by means of Rule 506 know and understand the new addition to Rule 506 because failing to comply with Rule 506(d) will disqualify the entire offering. Rule 506(d) identifies certain persons that may potentially become “bad actors.” It also lists certain events (“disqualifying events” or “bad acts”). An offering cannot be made using Rule 506 if it includes a “bad actor” that is engaging or has engaged in a “bad act.” This blog post focuses on (1) who may be a potential “bad actor” and (2) what constitutes a “disqualifying event” or “bad act.” The follow up blog will discuss certain exceptions from disqualification and how to obtain waivers. Who are the potential bad actors? • The issuer of the securities (as well as any predecessor of the issuer or any “affiliated issuer.” An affiliated issuer, as the name suggests, is an affiliate (a person who controls or is controlled by the issuer) who is also issuing securities in the same offering. • Any general partner or managing member of the issuer. 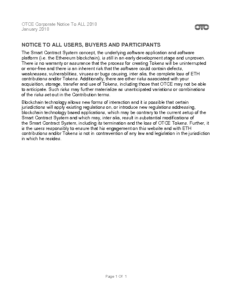 • Any beneficial owner of 20% or more of the issuer’s outstanding voting equity securities. • Any investment manager of the issuer (if the issuer is a pooled investment fund), as well as its directors, executive officers, other participating officers, general partners, and managing members. 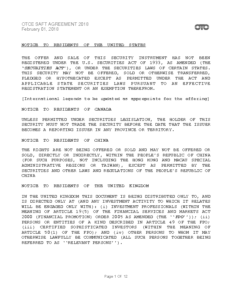 • Any natural person or legal entity who has been or willed be paid to solicit purchasers of the offered securities (e.g. a placement agent), as well as their directors, executive officers, other participating officers, general partners, or managing members. As you can see, the list of potential “bad actors” that an issuer will need to vet can potentially be a long one, especially, for example, if they will be working with several different placement agents. That being the case, a company seeking to raise money in a Rule 506 private placement should be proactive in determining if they are subject to bad action disqualification at time they are offering or selling securities in reliance of Rule 506. 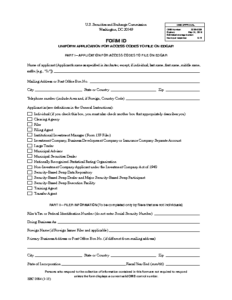 Some steps a company should take include adding bad actor disqualification representations and covenants in their placement agency agreements or securities distribution agreements and asking all participants covered by Rule 506(d) to complete a bad actor questionnaire and/or certification (and bring-downs of the same if the offering is long-lived). Also, the issuer may add a provision in its bylaws requiring each “covered person” to notify it of a potential or actual bad actor event. Further, the issuer should check and re-check public databases for any triggering events. We will talk more about the reasonable care exception in the next blog. What constitutes a “disqualifying event” or a “bad act”? 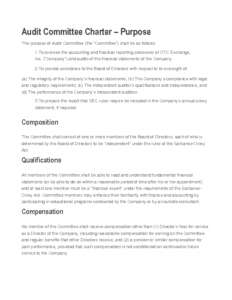 • Is subject to a final order from state securities regulators, insurance, banking, savings association or credit union regulators, federal banking agencies, the CFTC or the National Credit Union Administration that either (1) at the time of the current sale, bars the person from association with any entity regulated by such a commission, agency, etc. ; engaging in the securities, banking, or insurance business; or engaging in savings association or credit union activities, or (2) constitutes a final order based on a violation of any law or regulation prohibiting fraudulent, manipulative, or deceptive conduct. 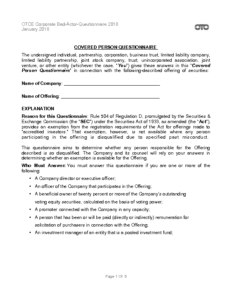 • Has filed either as a registrant or issuer, or who acted or was named as an underwriter for, any registration statement or Regulation A offering which, within the five years prior to the current securities offering, was the subject of an SEC stop order, refusal order, or an order suspending the Regulation A exemption, or who is currently the subject of an investigation or proceeding to determine whether such an order should be issued. 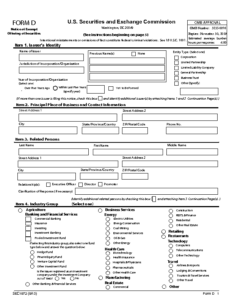 • Is subject to a USPS false representation order entered within five years of the current sale of securities, or who has received a temporary restraining order or preliminary injunction regarding conduct alleged by the USPS to constitute a scheme to obtain money or property through the mail by means of false representations. Only “bad acts” occurring on or after September 23, 2013 can destroy the exemption; those occurring prior to that date require disclosure, but do not themselves destroy the exemption. One important thing to note here is that this cut-off refers to the date of the conviction, order, etc. in question, not the underlying activities which eventually resulted in that action. For example, a broker who was suspended on October 1, 2014 for activity that occurred on June 3, 2014, would be a “bad actor” under the Rule, because the actual suspension occurred on or after September 23. Accordingly, the relevant look-back periods in the Rule are measured from the date of conviction or sanction, not from the date when the conduct occurred. Final thing to note is that Rule 506(d) is not triggered by actions of foreign courts or regulations, such as convictions, court orders or injunctions. 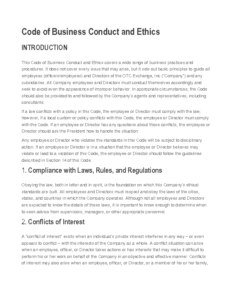 Given the serious, even devastating potential consequences that can follow from failing to catch a “bad actor” disqualification, I strongly encourage companies considering raising capital through a Rule 506 private placement to devote the necessary time and resources to ensuring that the company and its covered persons are in full compliance with the “bad actor” disqualification provisions of Rule 506(d). 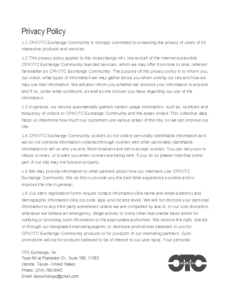 Can non-US residents invest in OTCE? 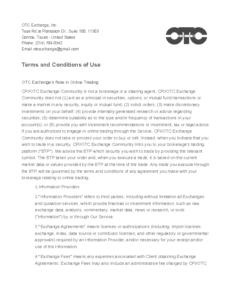 Yes, non-US investors can participate in OTCE as long as they meet US accredited investor or qualified purchaser requirements. In general, non-US residents must also meet local laws regarding investment compliance. Accreditation can take up to 72 hours, though it’s usually much faster. Please contact us with any accreditation specific inquiries. Documents you upload as evidence of accreditation are kept private and are only used to assess your accreditation status. 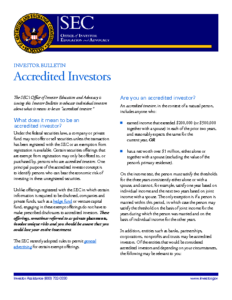 Our team of licensed attorneys and CPA’s review these documents to ensure that the relevant accredited investor thresholds are met. Qualified purchasers as defined by the US Securities and Exchange Commission are individuals with at least $5M in investments or funds and other entities with at least $25M in investments. What types of currency can I invest with in OTCE? 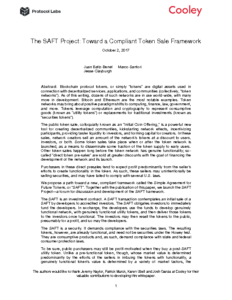 The Simple Agreement for Future Tokens (SAFT) is an instrument and open-source framework for token sales. The SAFT is the default agreement for investments on CoinList. While the SAFT has been extensively reviewed by multiple legal teams, we strongly recommend you consult with your own legal, investment, tax, accounting, and other advisors, to determine the potential benefits, burdens, risks, and other consequences of such a transaction. Can I use the SAFT? Absolutely. The SAFT is open-source and free for all to use on launch. The SAFT was created by Protocol Labs in partnership with AngelList and Cooley. “Regulation D” is a government program created under the Securities Act of 1933, instituted in 1982, that allows companies the ability to raise capital though the sale of equity or debt securities. The programs were designed to provide two main things – the needed “exemption” to sell unregistered securities in a private transaction (something that happens in any transaction involving investors) and the appropriate framework and documentation for doing so properly. There are several programs that are available under the Regulation D Exemption. Most of our clients typically choose the JOBS Act 506(c) program as it allows general advertising and solicitation of the offering and also benefits from some compliance efficiencies with State “Blue Sky” filings. Any company or entrepreneur that is seeking to raise equity or debt capital from investors properly and legally. Even if you plan on only having one or two investors in your transaction you need to provide the transaction framework, related disclosure documentation and investment agreements necessary for raising capital. A Regulation D Offering provides the proper transaction structure and documentation for raising debt or equity capital from investors. Trying to raise private capital of any amount without these fundamentals in place is almost impossible. Most companies use the programs to raise from $25,000 to $50,000,000 in capital. Regulation D Offerings have been used for a wide variety of transaction and industry types: corporate seed capital, corporate expansion capital, film production capital, real estate equity funding (acquisitions, development projects, golf courses, rehab), capitalization for early to pre-IPO stage Internet and technology companies, expansion funding for retail companies, and product development and distribution funding. Use the menus at the top of this page to find specific information on the available Regulation D Programs, the advantages of a Regulation D Offering, and details on the offering preparation process. A key aspect of a successful private placement offering is the structure employed in the offering. Often overlooked, this is a major part of a successful placement and proper structure is critical to the success of the offering. Your company may have a compelling opportunity, but if you do not employ the appropriate structure for the investment transaction the company could easily have an unsuccessful capital raise. At any given time our firm has a substantial number of clients on the market raising private capital from investors. We are intrinsically involved in the execution of our clients’ offerings and are highly knowledgeable regarding the type and form of transaction structure investors find appealing. There are a substantial number of variables involved in the proper structuring of an investment transaction and private offering of securities. The expertise of our staff in the proper structure and execution of private placement offerings is a significant advantage for our clients. 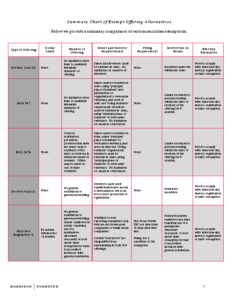 Structure for an offering is fully dependent on the company’s business and planned operations – thus the following is just a general overview of basic investment structure options for an offering. There are two basic types of Regulation D Offerings that can be structured; an “equity” offering where the company is selling ownership in the company (via the sale of stock or an LLC membership unit for example) to raise capital – or a “debt” offering where the company raises debt financing by selling a note or bond instrument to investors with a set annual rate of return and a maturity date that dictates when the funds will be paid back to investors in full. An equity offering is where the subject company sells an ownership stake in the company or project to investors. Equity is usually preferred by early stage companies that need flexibility regarding capitalization. We also execute about 80% of our real estate offerings as equity based investments. In an equity situation investors profit as the company profits since they are partial owners. In some cases, for example an LLC raising capital for real estate acquisitions, there may be a Preferred Return distribution made first to investors prior to sharing proportionally in additional operating income with management and founders. Most operating companies sell 5%-30% of their company for a first round funding – obviously there are exceptions but this tends to be the average range. A real estate project or real estate fund, or oil and gas company typically deploy a different structure regarding investor share of operating income and providing participation in the accretive value of the asset(s). Most of our clients are using either a “C” Corporation (where you would sell stock to investors) or a Limited Liability Corporation LLC (where you sell a membership unit to investors). Real estate and energy transactions tend to use a Limited Liability Company or Limited Partnership as the issuer entity type. Investors typically profit in two ways from an equity deal; via their proportionate “per share” percentage of company profit (called a dividend or profit distribution depending on entity type) and via the final sale or company redemption of the security through an exit strategy (example: the company buying the securities back from the investors, the company and its issued securities being bought out by another company, going public and selling on the open market, or a real estate asset being sold, etc.). There are significant differences between how an offering for an operating company (a software company for example) would be structured versus a real estate fund, real estate project, or energy company offering would be structured. There are also permutations from the base equity structure including convertible preferred shares, redeemable preferred shares, and for an LLC the utilization of various classes of Membership Units to provide specific investment terms and rights to investors and management control and management participation in net income to the manager(s). Assisting the client in structure is part of our core services and RDR clients benefit from our vast expertise and transactional experience in developing proper structure. A debt offering functions much like a private business loan where the company sells a promissory note to investors. The note sets forth the terms and conditions of the loan arrangement between the company and the investor. Thus, a note would provide a certain interest rate typically paid annually to investors with a maturity date that dictates when the principal is paid back in full to investors. The downside to a debt offering is; (a) you have a balance sheet capitalized with debt which may limit options for leveraging external funding and; (b) you have default risk should you fail to make an interest payment or fail to repay funds at maturity. Notes can be convertible into equity within the company which provides investors the security of a Note but the capability to participate in equity ownership at a later date. Developing proper structure is company and project specific – thus the prior overview is providing only a general understanding of the various forms of capitalization. For more specific guidance on potential structures for your company or project – please call us today to discuss (303) 984-4883. Ready to engage in general advertising of your private placement offering to investors? The JOBS Act, passed in April 2012, mandated the creation of a new exemption under the Regulation D 506 program that would allow for general advertising of an offering to accredited investors. This new exemption is termed “506c” and is widely known as the “general advertising” 506 program. The SEC filing process will be adjusted to include a “pre-filing” of Form D with a 15 day waiting period prior to advertising being allowed for the offering. 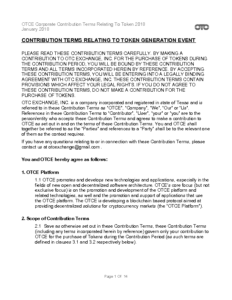 There are some other small adjustments to execution aspects of the offering, but the above listed changes constitute the primary modifications inherent in the 506c program. It is important to note that the current 506b program will still be available for issuers that do not need the capability to engage in general solicitation.